In response to Kirks comments, I’d argue that the unexpected hybrid is not the relationship of Ray’s playfully articulated objects and Ammons “flatter” internal conversations of unfinished strokes. But instead, the hybrid plays at multiple scales… objects, space, proximity, sound, and smell all play critical roles within the gallery that require attention. These might not all be overt or intentional, but as a participant in the space it becomes our responsibility to consider all of it. Meaning the space, the viewer, and the intentional placement of objects in the gallery play interdependent roles of navigating our judgement. The necessity to be in the space, to hear the echo of the door shutting behind you, navigating your sense of high and low… near and far… materiality of wall and floor. The entrance might even start sooner than that, for there is no sign to LTDLA (but a faint flag on the east side of the building) instead you are left to discover it… through a friend on social media or maybe by chance after leaving the predictable crowd of an opening across the street. There is something to the unexpected, in a sublime sense. To wonder upon a space and find a language to itself. Requiring you the viewer to give full attention to not just the work, not just the space, but your own position within it. At a moment where the single shot/ social media story becomes enough to say I was there…. Were you? I remember having to use a Thomas Guide for Navigating through Los Angeles. A starting point and an end point, in which you were required to fill in the rest, forcing a heightened level of attention and awareness for the in-between. This is not a case for nostalgia, but an observation of how literal navigation has changed. Although we have more options today (which I’m in support of), the start and stops seem to be driven more from social surface platform excitement, then internal personal observation. The gallery hopping charrette or “showing up” becomes more critical then the observation/ attention to the work. Go here, go there, get that video, get that shot, and move on to the next one. In contrast to a statement from the LTDLA press release… “to with no rudder the process can be slow and indirect”. Within our contemporary context of speed, efficiency, and options… comes a heightened sense of anxiety for “not missing out”. Why not take a pause towards the “slow and indirect”? The work at LTDLA asks more from its viewer than just visual attendance and maybe this is a critique to viewing contemporary work in general. 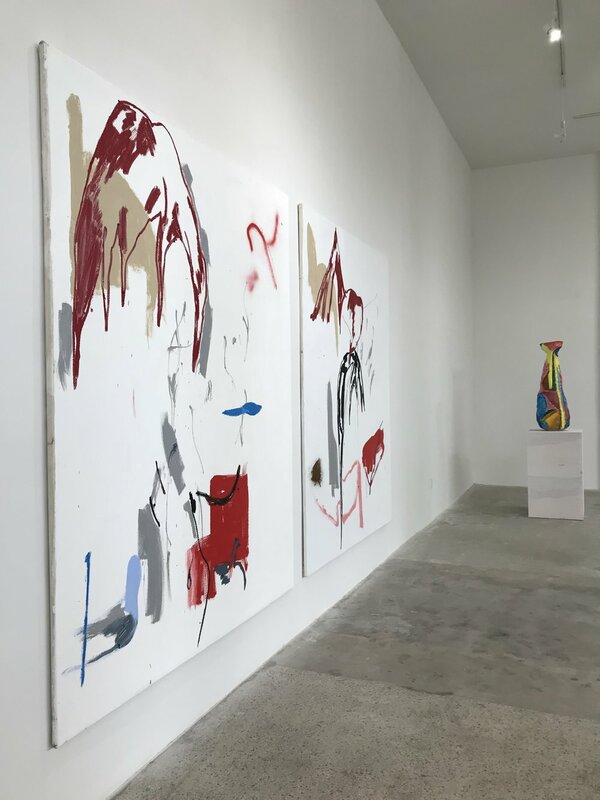 The attention to space, the proximity of object to painting, the subtle color difference of podium to wall, to just be there is no longer enough.